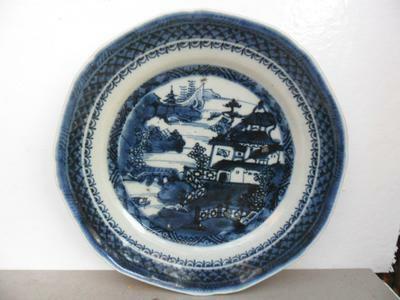 I have blue and white Chinese scene plate. The blue color is very dark. I am not sure this is Chinese or just some of South-east Asian product. Please help me to identify this plate. Comments for Chinese blue & white? Difficult to tell. I would need to do a hands-on inspection. But there is a good chance that it is from that period. The bottom is 18th century, Chinese. Usually, this would be the so-called willow pattern, export porcelain. However, there are no willow trees. 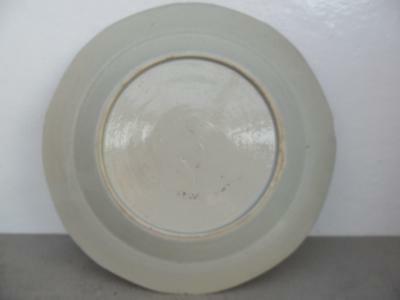 The painting is substandard in view to quality, compared with the average export porcelain. Especially the band decoration around the central picture is very crudely painted.